Here's a delicious holiday treat or even gift! 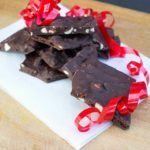 You can't go wrong giving somebody chocolate bark. It's a lovely gift for the holidays. In a small slow cooker or double boiler, melt the chocolate chips with the coconut oil. When fully melted, stir in the the nuts and cranberries. Pour the entire mixture onto a parchment-lined cookie sheet and spread out into an even layer that is as thin as possible with all the chunks. Sprinkle with a light layer of coarse sea salt for garnish. Place the pan in the freezer and freeze for at least 30 minutes. Remove bark from freezer and break it apart into pieces. I got about 20 equal pieces out of it. Package for a gift or enjoy for a treat!